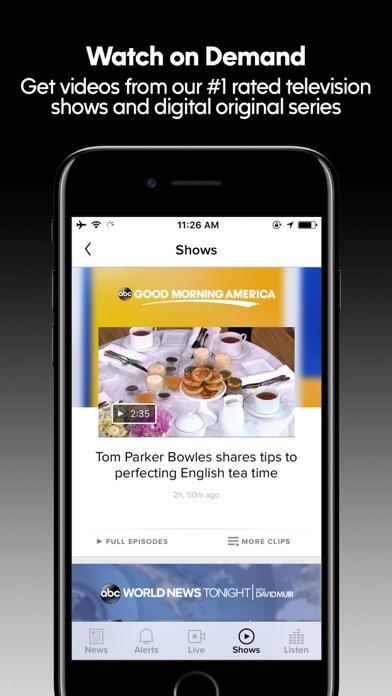 Watch ABC News directly from your iPhone or iPad – Watch streaming live coverage as news breaks and get the latest clips from your favorite shows including Good Morning America, World News, Nightline, This Week and 20/20. Get breaking U.S. and world news or catch up with the latest stories in politics, entertainment, weather, health, technology, science, and business: - Get ready for the 2018 Midterms with ABC News. Straightforward coverage of all the primaries, campaigns, and rallies leading up to the midterm election. Get ready to vote with live video of campaign rallies, follow reporters on the trail with candidates, and learn about the issues. 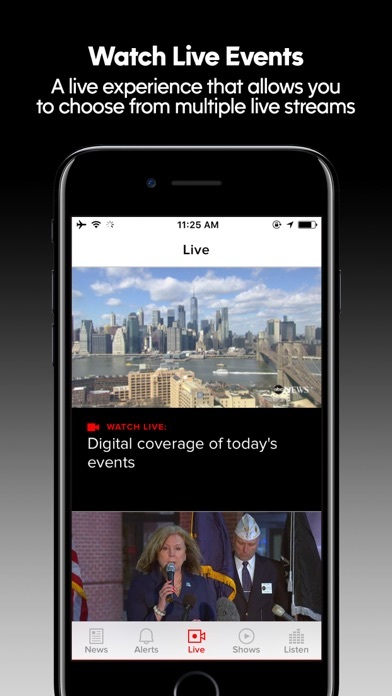 Watch streaming live coverage as news breaks, including breaking political news this election season - Get personalized alerts & a custom ‘News Inbox’ keep you from missing stories for the topics you care about STREAMING NEWS - VIDEO CLIPS & ABC NEWS RADIO: No Cable subscription - No problem! Get hassle-free news, wherever and whenever you need it, no signup or service required! 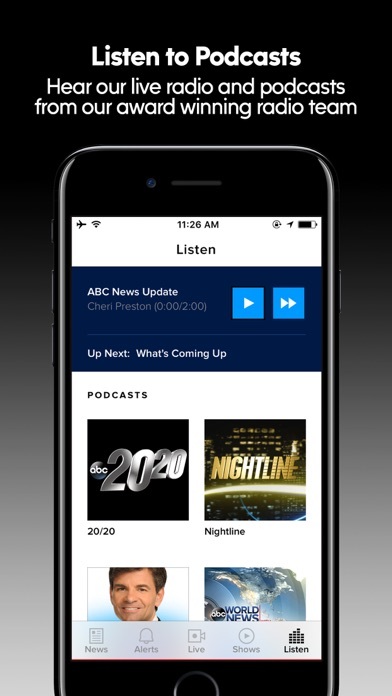 Our new ABC News app lets you stream news from anywhere, whether you have WiFi or just a 3G connection - No need to log in or have a cable subscription. Not interested in reading the News? Watch local and national news clips, check out news slideshows or listen to ABC Radio! 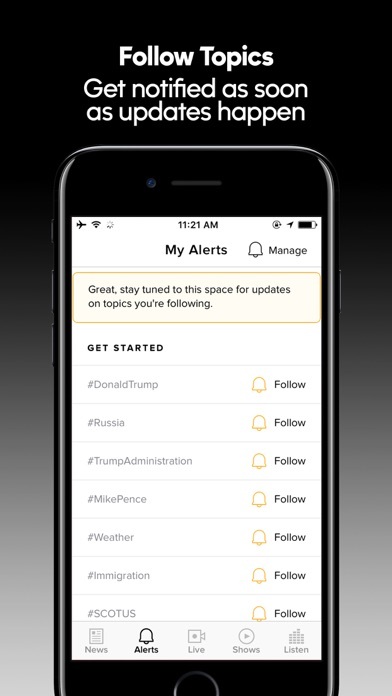 NEWS ALERTS THAT YOU CONTROL: The ABC News app lets you set up and control a personalized list of alerts so that we can send you push notifications about the topics that interest you. You can tell us how often you want to get the push notifications, and when. No need to wade through a bunch of news that you don’t care about! We will help you find exactly the stories, articles and videos that you are interested in. NEWS CATEGORIES INCLUDE: -US News -Politics -Weather -Health -Local Interest Stories -International News -Investigative Reporting -Lifestyle & Entertainment News -Health -Business -Technology News SEARCHABLE MULTI-MEDIA NEWS OF ALL TYPES: Read, watch or listen to news that you want to hear! 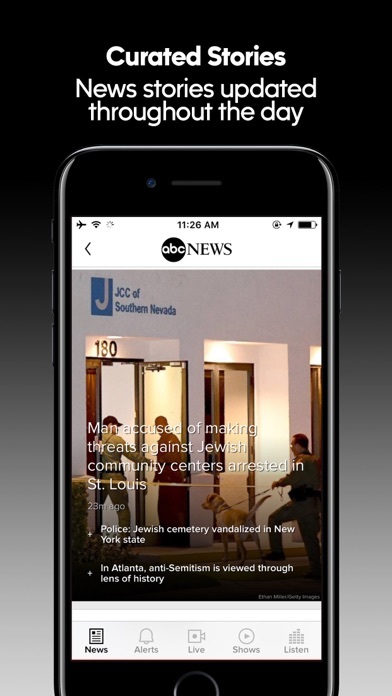 The ABC News App lets you search to find exactly what you are looking for. You can search by keyword, show or topic. We also have sections for ‘Trending News’ ‘Top Stories’ and the ‘Daily Rewind’ which will show you a visual recap of the events of the day! SAVE FAVORITES & SET ALERTS: Want to skip straight to your favorite topics? Save stories and topics you like in your Favorites, and we will automatically add those stories as well as any follow-up news related to those stories. Your ABC News Favorites holds just the stories that you care about. LOCAL NEWS STORIES BY GEOGRAPHY: Watch local stories from ABC stations in Chicago, Fresno, Houston, Los Angeles, New York, Philadelphia, Raleigh & San Francisco. I had to delete the app because there’s an extremely bizarre glitch it’s been having lately: it starts playing audio of a news feed, while the app is closed. And it’s nearly impossible to turn off. It actually drained my battery and used God only knows how much data because it was doing it for hours once before I finally realized it (my phone was on silent so I couldn’t actually hear it). It happens at least a couple of times a week. I like the news updates, and I feel ABC is better with doing updates than Fox or CNN or anyone else, and the app looks nice enough, but this has caused me to delete it. If it can turn itself on without me doing it, what else can it do without my knowledge? With recent security and privacy concerns about Iphones, it does make me wonder. I have no idea what has been going on but lately this app has been using a significant amount of data in the background playing video and audio without me initiating it. I really used to love this app for its breaking news and video but after discovering the unprecedented amount of data it has been using in the background I uninstalled it immediately. I am shocked that most of the evening stories are video, if I’m reading in a public place I don’t want video blaring. I just want to read the news. The new format for ABC news is practically unreadable. The old format was good, but now it's very poor, with some text too small to read. I would rather read my news and not watch video, so I hoped the new format would foster that goal. No luck. This app has a tendency to play sound when there are no apps open and no sound meant to be playing in any capacity. Super annoying and loves to drain the battery because it is constantly playing. I have really liked this app but as time goes by I’ve gotten really annoyed at the videos they attach to articles. You either click a link and the video is just the article that you have to read in video form(what’s the point?). Or the link says one thing and the video is something else mildly related. You end up wasting your time watching a video then having to read the article anyways. The display keeps tilting to the far left when I open this app for some reason. Booming economy in the U.S., ninety percent of illegal opioids and other drugs still coming across the open southern border, yet neither of these stories get any news coverage. Guess I should quit working and get a free Bama phone. Then this app would prolly work better. The app doesn't work. I keep getting a connection timeout error Everytime I try to open the app. If you are looking for current, up to date news, then this app is NOT for you. Stories take hours (sometime 7-8 hours) To be updated with current information. Waste of time. I used to really like this app for news. Then in the past month it starts randomly playing news audio. I check all my open apps and even when it’s not open, it plays. I can’t force close it if it’s not open. So I go open the app and the audio stops. Rather a sneaky way to get me to open the app! What else is it doing that I’m not aware of? I don’t want to get rid of it, but this is crazy, so I might have to. This used to be my favorite news source, but the latest version misbehaves. At random times, even when I am not using my phone, it will start playing news audio. It even does this when the app is not running! The audio just suddenly starts playing. The only way I can ensure this won’t happen any more is to simply uninstall it and not use it anymore, which is disappointing. If I click on your “support” link in the Apple store, it just takes me to your news app, which is of no help at all. Randomly my phone will be sitting down in a table and start playing some audio clip. Sounds like podcast or news or interviews. I close all apps and it is still playing! If I play music it stops but will start again randomly later on. I sat and listened for a while and figured out it was the ABC NEWS APP! Hijacking my phone playing news and ads. I deleted and it stopped. For SHAME! This used to be the best news app but now it is awful. The clips don’t march the headlines. The selection is extremely limited without a lot of searching. And the format is difficult to navigate. Bring back the old ABC News app! ABC news notification messages often just go to a blank app or generate error message. I had to delete this app because it randomly blasts audio of live streams, even when the app isn’t running. There’s no way to pause or mute the sound, or keep this from happening. Love their news coverage. Great reporting. But the app is only moderately enjoyable. Terrible ad experience (ad plays before EVERY video, can’t adjust the volume) but that’s not the worst. I often need to come back to an article in the middle of reading it but the app won’t let you do that. If you jump to another screen on your phone (Safari, Messages, etc) the app automatically restarts. It creates a terrible experience. If you watch current news and when it breaks to a advertisement, you cannot touch the screen to adjust volume or size. Your screen gets sent to the advertisers site with no return button, and you are stuck . No way out or back . Your ABC News app is stuck permanently on the advertisers web page until you delete the app and re install on the App Store. I really enjoy watching ABC news on my phone, but recently it is very slow I think because of watch ads and other ads, so I am now looking for other sources for my news. Recent versions of the app have been very frustrating as scrolling through an article is not smooth at all. There are so many objects on the page between ads, photos, and overly complex layering effects that you don’t get a very responsive scroll-through, especially the further down the page you are. ABC News has always been the best at actually reporting the news instead of offering opinions like other News Agency however the app is terrible. One of the latest updates prevents the ABC News app for iPhone and iPad from working with HughesNet satellite internet. I suspect the latest app doesn’t handle the 500ms response time inherent to satellite internet. While this is my primary news source, some of the pages are not updated very frequently. One of the headlines is still about Frank Sessions and Al Franken from over two years ago. Much of the content is not updated for months. Today is 12/1; however, the app is providing yesterday’s news. This is not only frustrating but also unacceptable! I find your App for my iPad Pro to be a -5! It takes over 5 minutes for your app to load stories I feel a VERY STRONG DESIRE to delete this app and get my news from other sources. This prob.. issue does NOT occur with my iPhone. I originally thought the forced volume on the ads was a mistake, and waited for an update. But even with updates this issue isn’t being addressed. It is frustrating to be in a quiet room and then having a Lowe’s ad blare out. I’ve become quick at closing out the app. Thanks for checking out the ABC news app. If you want to see more breaking news go check out the ABC news YouTube channel. For a network touting Made in America you sure wouldn’t know a single job was created the last year or that unemployment was at all time lows. Network is currently showing an almost nonstop Michelle-O-Thon but will probably resume their normal NPC talking points soon. While in the world would I want the ads to be playing the videos while my phone was on silence. It happens every time when I just wanted to read. Scared to use in vibrate mode. The current format of the ABC news app makes it almost impossible to navigate through without frustration. Quite an annoying piece of garbage although I prefer reading this news rather than some of the others available. This has always been my fav. News app, but now I’m looking for a different one. Even if my phones on SILENT the ads still play at full volume and won’t be silenced no matter how many times you hit the speaker icon. I understand the need for advertising but I can’t have my phone bursting out in noise very time I try to read an article. That on top of having to watch a video commercial before EVERY news video and sometimes they’re a full minute long, is so frustrating. Previously, I knew I could expect a video commercial before every other video, which I was willing to do because they were at max 30 secs long. But now more often than not, I end up not even getting to the news video because of the commercials or because as I scroll down the article it flips me back to the headlines at which point I’d have to rewatch the commercial in order to view the news video. So frustrated and so disappointed. Bummed to have to find a new news source. Still can't get ABC News! The app won't open! This app has evolved: it seems that the main focus of the developers is not upon conveying the most important news but upon delivering the most video ads. Went to your site to check out the World Series result and the Indonesian plane crash, somehow clicked on a Verizon ad and couldn't find a way out. Finally deleted the app, which seems to be going downhill with every update. Trying another network's app. Do not download this app. The app was not even in use and it used more than 5gb of my data. It also drained the battery of my phone very quickly. Very disappointed and a costly app. Probably the biggest issue is not being able to discern what is an article and what is an ad in the iPhone app. The iPad app's UI is still easy to use. Now the performance is really slow.